all the best. would’ve been lovely to be there, but the trek from bangalore is a bit much, given a performance here the same evening. just a thought – why can’t people ‘perform’ existing poetry? not only in translation, but also those originally written in English. poetry is after all meant to be performed, right? so why not perform ‘the second coming’ itself? i have been, for a few years now, and it generally works. Arka — Thanks for the support! 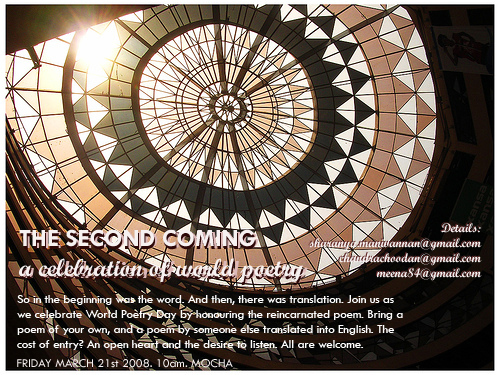 For this event, we wanted poems in translation for the same reason that writing support groups use prompts: it isn’t to limit, it’s to challenge. Don’t worry, we have many more events in mind — and themes will change, and occasionally we’ll enjoy themelessness. Hey, I got that. I was just suggesting that you guys look at performing poems by a Yeats, or a Dylan Thomas, or a Delmore Schwartz or a Billy Collins or Carol Anne Duffy – the list goes on – that is, if music bands can do ‘cover versions’, so to say, we performance poets can, too. I was a reader of poetry before starting to write, and to me it has always been something meant for the mouth. So do think about that as a future possibility. P.S. – sent you an invite for something we are doing here on Saturday, although you wont’ be able to make it, but I guess it’s important to let other people in the community know. Cheers!, and all the best. Is there a mailing list of some kind? I’d like to know about future events. Suchi — There is a blog, which we will unveil shortly. Do visit again — the link will be up soon. Interesting. Would try to drop in but I don’t have any idea what a poem is though. Just a curious person. How come the flier shows a picture of spencer while the event is at Mocha?! Rakesh — Hopefully, you can make it to the next event. Yup, that pic was taken by Chandrachoodan at Spencer’s. It just looks cool, and there’s that whole reflection thing which tied in with our theme. Could we have found a more apt pic? Sure. But hey.